welsh lamb is a fine thing.. Yet seeing how my godson lives in the weak valleys they never can get their hands on it at a readonable price! Weird huh? I guess that’s just how ‘trade’ works huh? This one was a red ticket number back in October.. Placed into the depths of the deep freeze.. Discovered through a good forage.. Saw some other gems in there too! 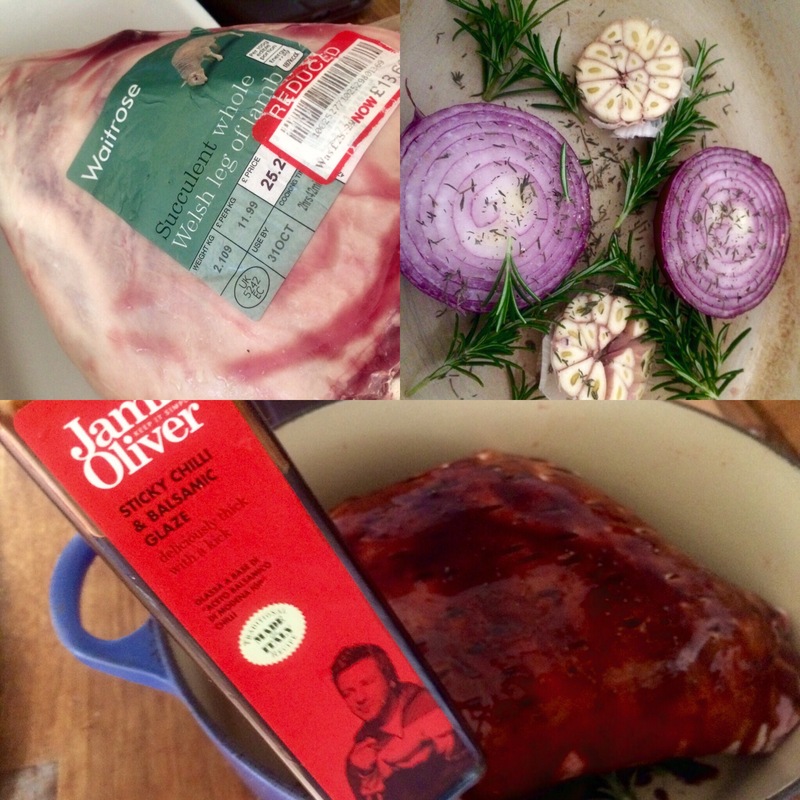 The lamb placed on top of a couple of cut onions and halved garlic..this Jamie Oliver glaze has been sitting in the cupboard for a while so let’s give it a go right? And into the oven with a drop of water for three hours.. Lid on.. It and the kitchen smells wonderful! 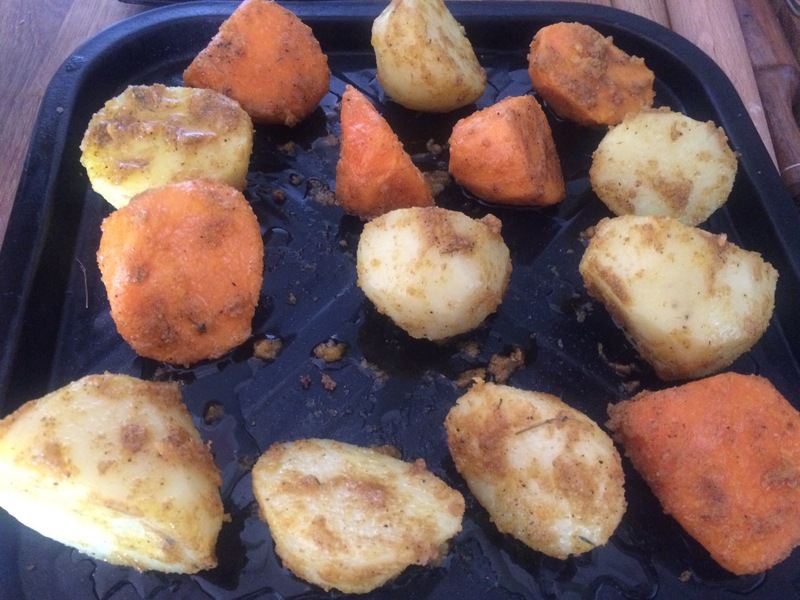 The roasties are a mix of sweet and regular.. Par boiled .. Roughed up and dusted with fine semolina and smuggled essouria spices.. 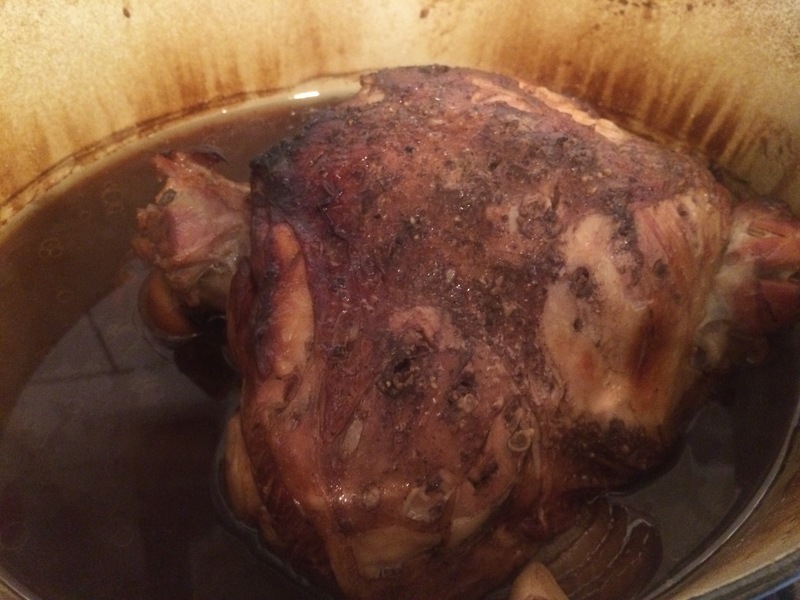 They roast off while the lamb stays warm and a gravy made from the pan juices ..the lamb just falls apart.. Exactly how this was supposed to turn out.. Cool! 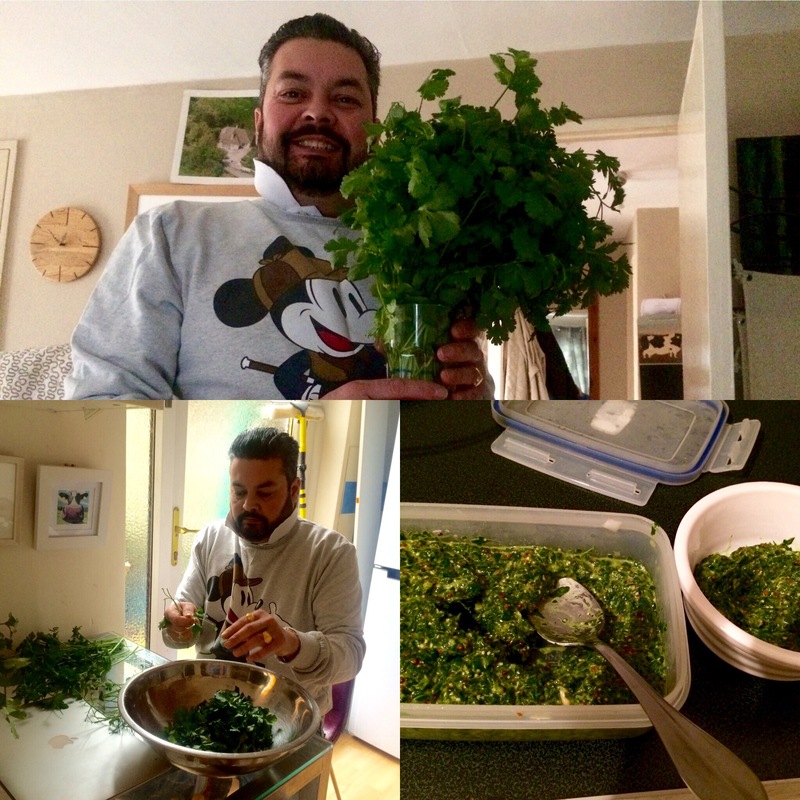 The salsa verde.. ‘Green sauce’ is made by stripping coriander and parsley leaves, adding pepper, salt, a fat French garlic clove and whizzed up with red wine vinegar , lemon juice and olive oil..it’s a labour of love.. Yet it’s worth it! And to be fair if it’s green and herby.. It’s a salsa verde inky book! All up..With cabbage , carrots and peas..
Good supper.. Excellent amount of leftover lamb .. That’s a number of suppers taken care of! 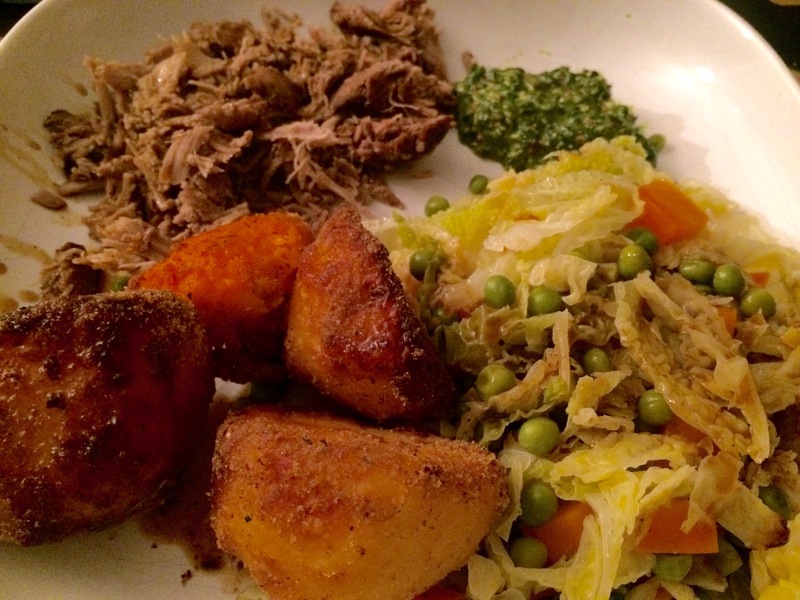 Tags: #sundaysupper, comfort food, roast lamb, salsa verde ideas, why is welsh lamb so hatd to get in wales? I’m giving that salsa verde a go! ….on the foraged lamb. Damn my arthritic fingers hitting the send button by mistake. well its kinda foraged…. i remember waitrose being particularly busy that day.. ahem.. plus the depths of the deep freezer.. an all round adventurer i would say! Here I was imagining you going over the mountain and through the woods in Hilda fashion to forage that leg of lamb! Salsa verde is a labor of love but it looks awesome! Great dinner. It was a clamber through the supermarket that day I remember! That looks fab. Never tried semolina on roast potatoes!